Maison avec accès privé de grille à la plage, super-équipé, climatisé, calme, très adapté aux familles avec enfants, grand jardin et terrasse couverte donnant sur la mer. La maison se trouve au bord de l'une des plus belles plages de la Sardaigne et le World Wide 50 mètres de long et plus de 5 km. une terrasse couverte avec barbecue avec table pour 6-8 personnes, jardin avec pelouse, avec des chaises et parasol, douche extérieure, des sentiers d'accès direct à la plage à pied. Eau: l'eau (réservoir), chauffe-eau électrique. Etre: air conditionné dans les chambres + 2 ventilateurs mobiles. Cuisson: four électrique, frigo-congélateur, cuisinière à gaz, mixeur, bouilloire, presse-agrumes électrique. Nettoyage: aspirateurs, machines à laver, fer et planche à repasser, séchoir à linge. Fun: la télévision par satellite. Es war wirklich ein schöner Aufenthalt! Davide ist ein sehr guter Gastgeber. Die Villa hielt, was Davide versprochen hatte. Die Villa ist sehr zu empfehlen! You and your beatiful family are alwais welcome in Sardinia. Die Lage dieses Hauses ist gerade für Familien mit Kindern unschlagbar, der direkte Zugang zum kristallklaren Wasser macht den Urlaub extrem entspannt. Davide ist ein sehr kompetenter und hilfsbereiter Gastgeber und immer erreichbar. Kühlschrank war kaputt, innerhalb eines Tages wurde ein neuer eingebaut. Great guest from Germany. The treat the house our proper home. I really apreciate I abosolutly recomend this guest. In diesem Haus voller Charme direkt am Meer verbrachten wir zu zweit eine wundervolle Urlaubswoche. Davide und sein Bruder Bachisio haben uns sehr herzlich empfangen - wir fühlten uns gleich zu Hause. Das Haus ist geschmackvoll eingerichtet und mit direktem Gartenzugang zum breiten Strand mit kristallklarem Wasser - 20 Schritte zum Meer - einfach grandios. Der Ausblick von der großen Terrasse auf das Meer ist überwältigend. Wir können dieses wundervolle Haus uneingeschränkt empfehlen! In this beautiful house full of charm right by the sea, we spent a wonderful holiday week. Davide and his brother Bachisio welcomed us very warmly - we felt right at home. The house is tastefully decorated and with direct garden access to the wide beach with crystal clear water - 20 steps to the sea - just terrific. The view from the large terrace to the sea is overwhelming. We can fully recommend this wonderful house! We loved the house. Location is superb. Walk out your own garden direct on the beach. Nice bars on the beach. Huge garden with several sitting areas. And three bedrooms with AC. We spent two weeks in this beautiful home. The house is great and perfectly equipped, Davide and his brother made us feel welcome and were very friendly. The garden is a lovely place and the view towards the sea one of the best we have ever seen. We recommend this place very much! Grazie! Thank you. You and your family were a wonderfull and clean guest. 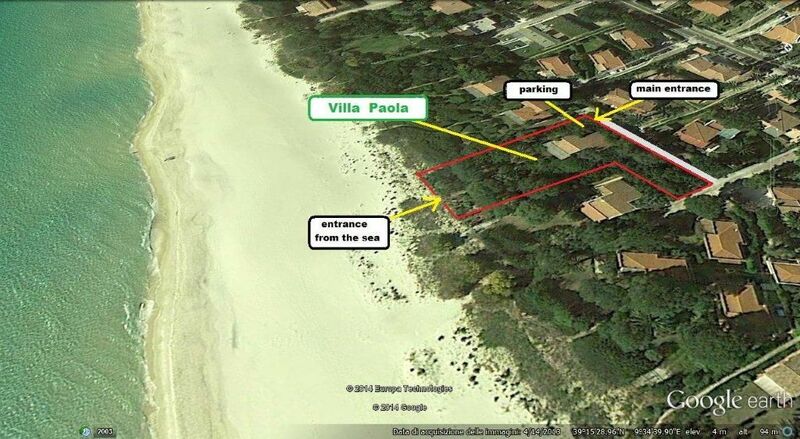 Hope you want coming back in Villa Paola. The location of the house is incredible! We spent one fantastic week at Villa Paola. The house is equipped with everything you need for a great vacation including a lovely garden and a barbecue. Right from the beginning we fell in love with its unique entrance to the beach - one step through the door and you are right there. The sea with its crystal-clear turquoise water and the beach are astonishing. We totally recommend this house to families who want to experience sea-side holidays.